Unified Payment is an all-inclusive merchant account provider suite that focuses on the mobile point of sales (POS). The application is a subsidiary of Net Element designed for simple payments acceptance or as a product inventory solution to build orders and record customer information for future use. It is an ideal software for small businesses looking to provide secure and seamless mobile payment experience while cutting the cost of sophisticated software or hardware. The application provides all the functionality a business needs in a tidy and easy-to-use interface. Some of its main features include: POS systems, Mcommerce solution, e-commerce solution, event processing, and sales central. In addition to all the features, Unified Payments provides a bankcard reader which is EMV compliant and can process Apple Pay transactions via NFC. Unified Payments is a robust software that provides value-added solutions and bankcard payment processing services. The application enables small to medium size businesses to take cashless transactions for products and services to the next level. It provides helpful features which include POS equipment, merchant business analytics, transaction processing, fraud detection, chargeback management, and risk management. 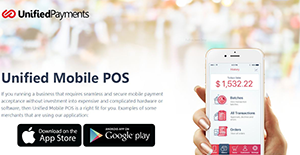 The mobile POS offers an easy and affordable way for merchants to accept payments via mobile devices. The solution employs robust EMV technology to safeguard your business from liability while giving your customers the self-assurance to do business with you. It provides EMV enabled card reader terminals and EMV ready POS systems. In addition, the TSYS class A-certified credit/debit card readers terminals enable all business owners to connect to TSYS on the backend, thereby decreasing monthly processing fees. The loyalty card module allows merchants to offer personalized incentives to increase customer loyalty and boost sales. Business owners using the opt-in registration page get the opportunity to export valuable customer demographic information. The information can be used to magnify marketing initiatives and target customer with custom-made offers. The great reporting features offered by this solution allow access to transaction tracking and make it easy for merchants to establish individual spending patterns. It provides easy to understand charts that enable you to analyze sales and improve business performance. Bank reconciliation is also a breeze with deposit, ACH transactions, chargebacks, and retrieval reports. If you are considering Unified Payments it might also be sensible to investigate other subcategories of Best Mobile Payment Systems listed in our database of B2B software reviews. Since each organization has particular business requirements, it is prudent for them to desist from seeking a one-size-fits-all perfect software solution. Needless to say, it would be pointless to try to find such a platform even among popular software applications. The smart thing to do would be to catalog the various essential elements that require consideration such as key features, budget, skill levels of workers, company size etc. Then, you should do your research thoroughly. Read some Unified Payments reviews and look into each of the other solutions in your shortlist in detail. Such comprehensive research can ensure you reject ill-fitting applications and zero in on the system that provides all the aspects you require for business success. How Much Does Unified Payments Cost? We realize that when you make a decision to buy Mobile Payment Systems it’s important not only to see how experts evaluate it in their reviews, but also to find out if the real people and companies that buy it are actually satisfied with the product. That’s why we’ve created our behavior-based Customer Satisfaction Algorithm™ that gathers customer reviews, comments and Unified Payments reviews across a wide range of social media sites. The data is then presented in an easy to digest form showing how many people had positive and negative experience with Unified Payments. With that information at hand you should be equipped to make an informed buying decision that you won’t regret. What are Unified Payments pricing details? What integrations are available for Unified Payments?